"Suffer the little children to come unto me, and forbid them not; for of such is the Kingdom of God" (Luke 10:14). His great concern for children was such that he came to be considered the patron saint of children, but he did not limit his benevolence to children alone, as his life story bears out. Stylianos was born during the seventh century in Adrianopolis in the province of Paphlagonia into a family which for generations had known nothing but poverty, a circumstance which was accepted without complaint and in which the simple, uncomplicated life afforded them greater time for religious matters. What the family of Stylianos lacked in material things was more than offset by the wealth of a deep faith in Jesus Christ and a cheerful commitment to the Messiah who never owned anything more than the clothes he wore. Stylianos was early made aware of this affinity with the Lord and by the time he had reached maturity had acquired a profound sense of responsibility to the Savior. Determined to serve Jesus Christ to the fullest of his ability, Stylianos joined the hermits of the desert with a view toward cleansing his soul through a period of meditation and prayer, as well as through association with men likewise pledging their lives to Jesus Christ. Unlike most other hermits, however, he did not withdraw from society altogether, preferring to go among the people for whatever good he might do, and then returning to his little cave for rest and prayerful meditation. One night while he prayed for guidance in helping others, Stylianos felt a divine presence and was consumed by the great glory of the Holy Spirit, emerging from his cave the next day with a spirit of exultation and serenity he had never known before. In his customary rounds, wherein he counseled and comforted, he felt compelled to place his hand on a stricken child, something he had not up to that time dared to do; he felt the power of the Lord being transferred to the ailing youngster through his extended arm. The child immediately recovered, and thenceforth St Stylianos was sought after by every suffering soul for miles around, young and old. His cave became a magnet for the sick and suffering, many of whom received complete cures not only through the power in this man but through their faith as well, without which a sufferer's case was hopeless. 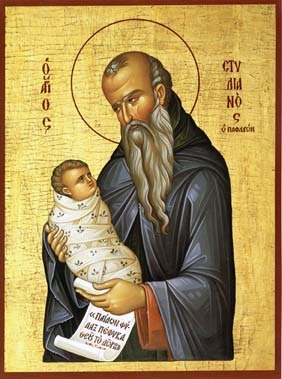 It was this time that St Stylianos concerned himself primarily with children, not just the physically afflicted but also those who were in need of spiritual guidance. Families from all walks of life entrusted to St Stylianos the enlightenment of their children, and he was forced to seek out larger headquarters and to recruit from the ranks of his hermit friends the assistance needed to tend to so many. His was probably the first day-care center of the world, where mothers could safely leave their children while tending to other matters of the home. St Stylianos was inadvertently qualified to become the patron saint of children yet to be born, owing to his miraculous intercession for a young woman who helped him with children but could bear none of her own. When the woman conceived, her husband out of sheer joy spread the word of this miracle, and before long many barren women came to the great hermit. Those whose faith in Jesus Christ was genuine became fertile. The cheerful countenance of St Stylianos was his hallmark, because he seemed always to be smiling, Now and then, however, he would be challenged by an outraged discreditor of little faith, and only then would the beaming hermit's face darken with a scowl. He was also approached by greedy mercenaries with all manner of propositions for commercializing his talents and reaping a tidy fortune, but for these people he always had the same answer: that he had been paid in advance for his services when the serenity of the Holy Spirit came upon him. He would smile as they left. He lived to a ripe old age, and it is said that, when he was buried his countenance still beamed with a faint smile from the light of the Lord.